What was the trigger that made you both decide to lose weight? I have tried many times over the years to lose weight with varying amounts of success. I had at one point lost 7st98lbs44.4kg from my very biggest (with Weight Watchers) but found the plan often too restrictive so the weight crept back up by about 3.5st49lbs22.2kg stone. 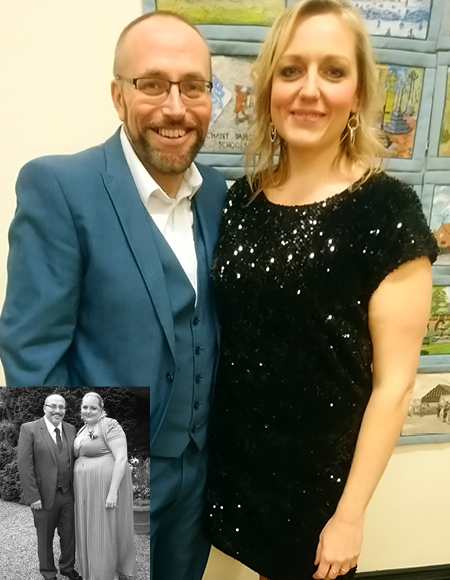 It was January 2018 when we both made a resolution to do something about our weight. I had gained about a stone over December/Christmas, undoing all the good work I'd done since the previous September and I'd had enough. Why did you choose Nutracheck to help you lose weight? I had done Weight Watchers before with some success, and tried Slimming World earlier in 2017. I remember being in the cafe with my mum whilst on Slimming World and I had to have a jacket potato and beans in order to be 'on plan' - yet it had the same calories as a cheese toastie which I'd have much preferred! It was my mum who made the penny drop when she said "Back in my day it was about calories in vs. calories out. Simple." I'd heard of Nutracheck from a little weight loss Facebook group I'm in, so I got the free trial and haven't looked back. Martin was keen to join in so he downloaded it too. How did you feel before you started losing weight? Before losing weight we both felt very tired and lethargic much of the time. My knees were very sore and I had even started to notice it becoming painful getting in and out of the car. I was in my mid-30's! That wasn't right. Martin too had aches and pains and was finding walking for any length of time difficult on his legs. Also, I particularly suffered with my self-esteem. I was very conscious of my size and hid away a lot, choosing to not go out to places with friends for fear of either looking horrendous or not being able to find anything to wear. What has keeping a food diary with Nutracheck taught you? It has taught us both that this isn't a 'diet'; it's a way of tracking what you want to eat and making it fit into a daily allowance. Nothing is off limits, it just has to be planned and thought about a bit. It has been really good for Martin too - learning about the nutritional values in foods as he had little awareness of this before. He now takes the time to look closely at what he's eating and makes much better choices. What are the biggest changes you've made? Did this affect what you cook for the household? As we don't have children together, the only people I have to cook for is us so that made it easier in a sense. Martin eats whatever I cook for him and I am a keen cook and enjoy making new things in a way that is healthy, too. The biggest changes we've made are that I cook a lot more than I did. I have a busy, stressful job and by Thursday I would just want a takeaway! Then there was the Friday wine and a meal out on Saturday. We both enjoy takeaway type foods but I will now often make them and save an occasional takeaway for a treat (but it's still all with my daily allowance!). We are also now very, very active. We joined a local hotel's health club and I am a very keen swimmer (a mile or so 4 times a week) and Martin really enjoys the gym. Plus we both love trying to beat each other's Fitbit steps and we love how it links with the Nutracheck App! This means we go out walking more and do things like parking at the far end of the car park so we have further to walk! Did you decide to lose weight together or did one of you start and that spurred the other on? I have always been the one most keen to lose weight, but Martin has always been happy to go along with it. What's different this time is, though, that he has taken ownership of his own weight loss and doesn't always just rely on me now. How did slimming together help you keep going? When one of us has a bad day, the other one is there to support and encourage. It has also meant we are both on the same page with regards to eating out and takeaways as we both want to stay on track as much as possible. What are your top tips for another couple considering losing weight together? Totally support each other, all the time. When one has a weak moment, it's important for the other one to be the angel on the shoulder, not the devil. Both getting on board with it 100% will make it so much easier to stay focused. So much has changed! Our free time activities now include walking/hiking, exercising, and doing things that don't revolve around food. We recently went on an Alpine rollercoaster which, at my very biggest, I would have been too heavy to ride. We have found that we make more time for each other now too and losing weight and changing our lifestyle has helped us value what we have. My confidence is so much higher than it was and I'm not scared to look in the mirror any more. I love shopping now that I can shop anywhere and Martin is also enjoying updating his wardrobe (with my help!). Any other milestones to report that you're really proud of? i.e. new hobby, sporting achievement etc. So much is new for us at the moment but I did go back on the stage in October 2018 with a lead role in The Pirates of Penzance - something I have avoided for years due to my weight but Martin has always done it and wanted me to join him.